Expo '67 is the World Fair of 1967 AD, held in Montreal to celebrate the Centennial of the Canadian Confederation. There are numerous clues pointing to possible temporary Passages that might have opened during the event. The pavilion of the German Federal Republic, for instance, was strongly reminiscent of the tents of the Kamour Blhyr; the Dutch pavilion seemed surrounded by its own Network, and a whole pavilion was allocated to Man in the City, while another was called the Labyrinth. 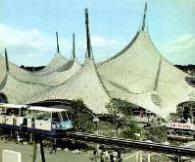 Even twenty years after the event, the old French pavilion was the site of a brief connection with the Fixorama of Alaxis 1).